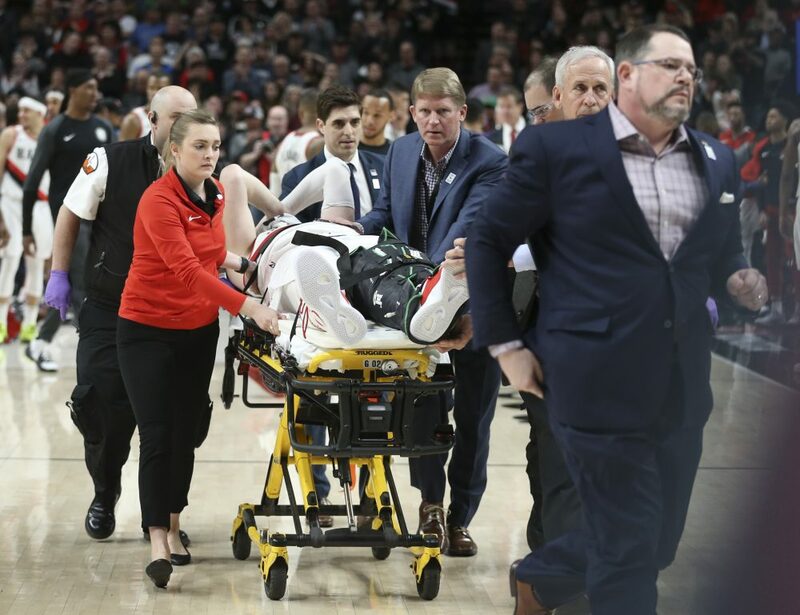 The Portland center broke both bones in his lower leg while battling for a rebound in the second overtime of Monday's 148-144 win over Brooklyn. PELICANS: New Orleans say guard Jrue Holiday had surgery to repair a core muscle injury and won’t play again this season. Holiday already has missed the past eight games with a strained abdomen for the Pelicans, who are eliminated from playoff contention. This season has been among Holiday’s best. The 10-year veteran averaged career highs of 21.2 points and five rebounds per game, tied his career high for steals per game with 1.6 and had his third highest assist average at 7.7. MAGIC 104, HEAT 99: Nikola Vucevic led six players in double figures with 24 points and added 16 rebounds as Orlando pulled away in the third quarter and held off Miami. • Wearing a Heat championship ring on both hands, Chris Bosh was honored Tuesday and watched a giant banner bearing his name and No. 1 raised to the rafters of AmericanAirlines Arena. HORNETS 125, SPURS 116 (OT): Kemba Walker had 11 of his 38 points in overtime and Charlotte beat visiting San Antonio to stretch its season-long winning streak to four games. RAPTORS 112, BULLS 103: Norman Powell scored 20 points, Serge Ibaka had 16 and Toronto beat Chicago for its eighth consecutive win over the struggling Bulls.